The rotator cuff is a group of four muscles that come together as tendons to form a covering around the head of the upper arm bone called humerus. The rotator cuff attaches the humerus to the shoulder blade and helps to lift and rotate your arm. Your arm is kept in your shoulder socket by your rotator cuff. 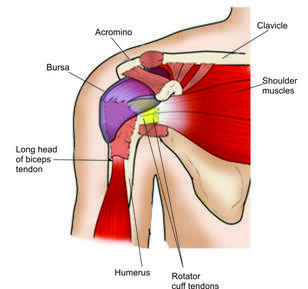 There is a lubricating sac called a bursa between the rotator cuff and the bone on top of your shoulder. The bursa allows the rotator cuff tendons to glide freely when you move your arm. When the rotator cuff tendons are injured or damaged, this bursa can also become inflamed and painful. When one or more of the rotator cuff tendons is torn, the tendon no longer fully attaches to the head of the humerus. Most tears occur in the supraspinatus tendon, but other parts of the rotator cuff may also be involved. The tear in the tendons begins by fraying. As the damage progresses, the tendon can completely tear, sometimes with lifting a heavy object. There are different types of tears. Partial tear - This type of tear is also called an incomplete tear. It damages the tendon, but does not completely sever it. Full-thickness Tear - This type of tear is also called a complete tear. It separates whole of the tendon from the bone. With a full-thickness tear, there is basically a hole in the tendon. What is the cause of Rotator Cuff Tear? Acute Tear - A fall on your outstretched arm or lifting something too heavy with a jerking motion can tear your rotator cuff or this type of tear can occur with other shoulder injuries, such as a broken collarbone or dislocated shoulder. X-rays- Plain x-rays of a shoulder with rotator cuff pain are usually normal or may show a small bone spur. There are several treatment options for a rotator cuff tear, and the best option is different for every person depending on your age, activity level, general health, and the type of tear you have. Activity modification- Avoid activities that cause shoulder pain. Nonsteroidal anti-inflammatory medication- Drugs like ibuprofen and naproxen reduce pain and swelling. Strengthening exercises and physical therapy- Specific exercises will restore movement and strengthen your shoulder. Your exercise program will include stretches to improve flexibility and range of motion. Strengthening the muscles that support your shoulder can relieve pain and prevent further injury. Steroid injection- If rest, medications, and physical therapy do not relieve your pain, an injection of a local anesthetic and a cortisone preparation may be helpful. Cortisone is a very effective anti-inflammatory medicine; however, it is not effective for all patients. There are a few options for repairing rotator cuff tears. Your orthopaedic surgeon will discuss with you the best procedure to meet your individual health needs. While each of the methods available has its own advantages and disadvantages, all have the same goal: getting the tendon to heal. The type of repair performed depends on several factors such as the size of your tear, your anatomy, and the quality of the tendon tissue and bone. Open Repair - A traditional open surgical incision (several centimeters long) is often required if the tear is large or complex. An open repair may be a good option if the tear is large or complex or if additional reconstruction, such as a tendon transfer, is indicated. All-Arthroscopic Repair - During arthroscopy, your surgeon inserts a small camera, called an arthroscope, into your shoulder joint. The camera displays pictures on a television screen, and your surgeon uses these images to guide miniature surgical instruments.